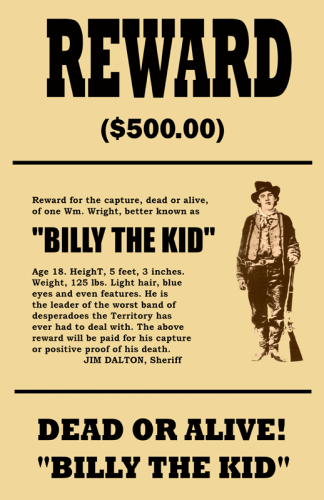 Billy the Kid Wanted 11x17 Poster - William H. Bonney (born William Henry McCarty, Jr.), (1859-1881) - Better known as Billy the Kid, and also known as Henry Antrim, Billy participated in New Mexico's Lincoln County War and became a frontier outlaw. 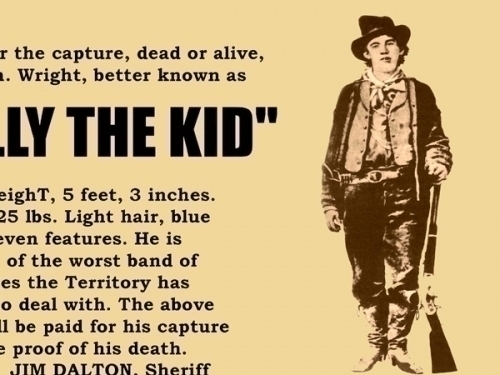 According to legend, he killed 21 men; but, he is generally accepted to have killed between 4 and 9. This poster is custom designed for Legends' General Store. You won't find it anywhere else. Printed on semi-glossy, 48 lb paper and measures 11" x 17".